Previous post: Ladies and gentleman, we have just reached our Cruising Attitude – for real! 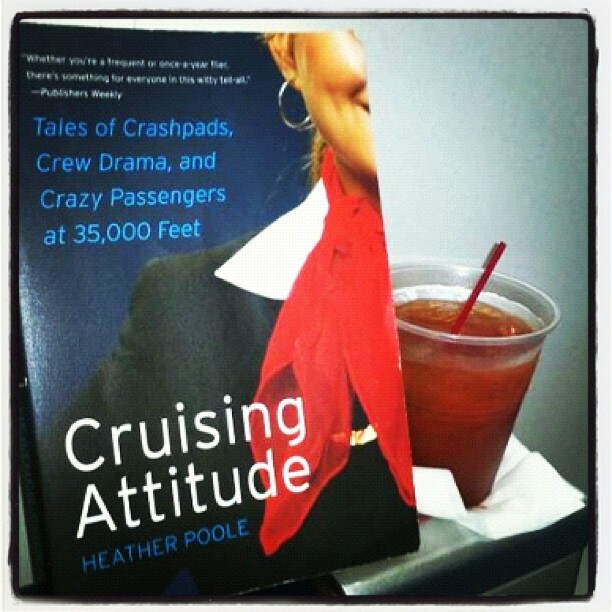 Is that my book drinking a Jack & Diet Coke in first class? Perhaps. Flight attendants don’t hate serving Diet Coke. Let me repeat, we do NOT hate serving Diet Coke. Nor do we hate serving passengers. Or even passengers in general. For the record, I drink Diet Coke both as a flight attendant and as a passenger. Hard to believe, I know, given all the recent articles and news reports circulating around about shocking flight attendant secrets. The so-called secrets (AKA interesting facts) actually came from the article I wrote for Mental Floss last month. The article I wrote was not about what flight attendants hate, and yet all I keep getting are interview requests to discuss just that. The funny thing is there are so many more interesting things to discuss in the article, like why short people can’t become flight attendants and what we do with dead passengers when there isn’t a corpse cupboard on board, but all anyone wants to talk about is Diet Coke. “Of all the drinks we serve, Diet Coke takes the most time to pour—the fizz takes forever to settle at 35,000 feet. In the time it takes me to pour a single cup of Diet Coke, I can serve three passengers a different beverage. So even though giving cans to first-class passengers is a big no-no, you’ll occasionally spy 12 ounces of silver trimmed in red sitting up there.” That’s 1 of the “10 shocking secrets” I wrote for Mental Floss. “Robert Redford and Mark Cuban have a few things in common. Besides being extremely nice and maybe even a little shy, they both made me nervous because they were way too easy to please. I’m not used to that. Mark, like Robert, only wanted a Diet Coke. That’s it. Keep in mind that I have a lot of experience serving Diet Coke. You might find it interesting to learn that it’s the most annoying beverage a flight attendant can pour for a passenger in flight, because in the time it takes us to fill one cup, we could have served an entire row of passengers. For some reason the fizz at 35,000 feet doesn’t go down as quickly as it does for other sodas, so flight attendants end up standing in the aisle just waiting to pour a little more…and a little more…and a little more…until passengers sitting nearby become impatient and begin shouting out drink orders I can never remember. “Just one second,” I’ll say, still pouring a little more…and a little more until finally I just hand them the can. I’ve actually had nightmares about frantically trying to finish a never ending Diet Coke beverage service before landing. Who would have guessed that working on a private jet and serving a single Diet Coke to one passenger would turn out to be even more difficult? I’ve been there, and yes, it’s amazing how much fizz that small can holds! Besides having the drinks chilled (and let’s face it, we have too many things to attend to during boarding to put chilling drinks on the top priority), one trick that seems to work for me is holding both glass and can at an angle, rather like pouring beer. Cool. I’m really curious to see if it will have any effect! There is a podcast called “Betty in the sky with a Suitcase” and in her podcast she interviewed flight attendants asking them the drink they hated to serve and they all answered Diet Coke. I believe that is where the rumor actually started. Found my way to your site from seeing an articles someone pinned on Pinterest giving your packing tips. Love them and your blog! I never gave to much thought to it before, but I’ve been tending bar for 12 years and as I read your Diet Coke commentary I realized it DOES fizz way more than regular soda! Even on the ground. Flashbacks to years of overflowing sodas and waiting for giant fizzy heads to die down running through my brain. I guess I had just adjusted to it without ever realizing it. In my line of work we also have spill mats to catch fizzy overflow though. Lol. It must have to something to do with the reaction of the artificial sweetner and CO2. Pour the beverage before adding ice and voila!